Chances are if you’ve been reading our blog, your curious to know if we are enjoying life in such a small space (in about 250 sq ft or so). I think after a month we can say we are. Because we only have what we need, and nothing more. It’s simple, its tidy, and everything has a place. I actually prefer my small fridge too. You buy what you need, meal planning becomes necessary, and you eat what you have in your cupboards before buying more because there just isn’t as much space to stock. Less is wasted. Amazingly, we have 8 cereal boxes right now, which is a whole shelf in the pantry, but its worth it when you go through it so fast. It’s warm outside, and with so much to do, we aren’t home much during the day. Josh and I alternate going surfing or to the gym in the morning, and go for a family walk. Then after Rylie has her midday nap we head out to the beach, check out the neighbourhood, ride our bikes, get together with friends, go shopping, or just hang out together at the pool. In the evening we make dinner, and don’t go too far after dark, so its a great time to catch up with family at home, or write some blogs. It’s a good thing business duties have been slow in the last month, its all been fun and games so far, but, things change. And, in the new year I start my Nurse Practitioner class via correspondence, so I’ll have to cram that time slot in somewhere too. Of course, there are things we miss having, like a dishwasher, and a washing machine. But honestly, doing all three loads at one time at the RV park facilities is really a plus. Instead of spending the day doing your laundry, its an hour and a half. Our trailer turns into a Chinese T-shirt factory at night when we hang things up to dry from the kitchen light, the antenna, the tv stand and the push out. Outside is just too dusty. Dog hair is another negative. The amount that accumulates in 24 hours is amazing. Not to mention, Nixon has bleached out and is going through a confusion shed. He doesn’t know what season its supposed to be. Hot during the day, cool at night, and dark early. 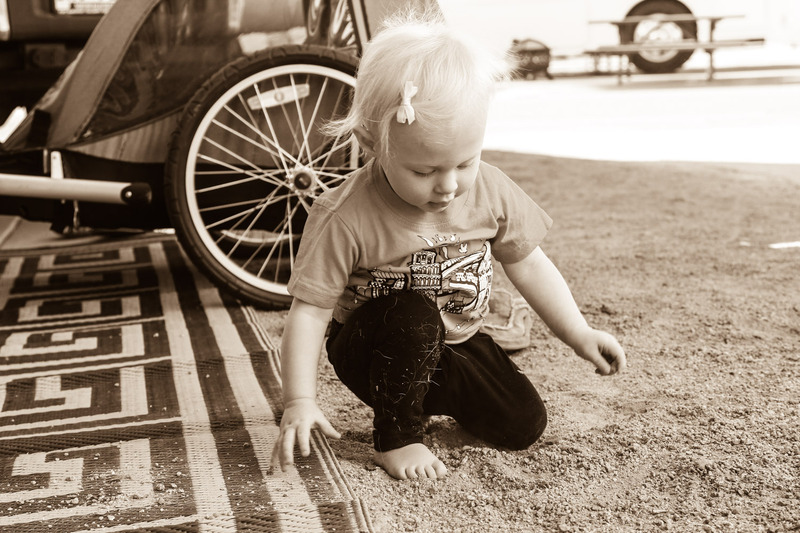 We haven’t spent much time outside the trailer while home, as Rylie just wants to play in the dirt. Yesterday we got a massive outdoor rug to cover up the concrete pad so its a little cleaner. We spent the afternoon practicing going down the 3 steps of the trailer to the rug and back up again before heading to the pool so she could practice her bubble blowing and squealing. The other day I joined LA Fitness, after testing a couple of gym’s for their spin class potential. They have an enormous 68 bike theatre style spin studio!!!! Wow. And, though I’m not really planning on using anything else there, they have a 5 lane lap pool, hot yoga, kickboxing, 2 full size basketball courts, 8 squash courts, and so many treadmills and cardio machines I can’t even guess the number. The smoothie bar I will be using. Rylie went to watch her friend Payten at dance class yesterday morning, but I think she’s just too little to participate at this point. We need to get her walking. There’s a reading group for small toddlers at the library that we’ll try out instead. Josh has found a break that he’s liking to surf, but the waves haven’t been cooperating in the last day or so. None yesterday, and really big today. I have yet to go surfing, and I’m working up the urge to go. I did go spinning on monday though, and got my crazy girl adrenalin fix. It was my first class since I was about 34 weeks pregnant, so it was FUN.